Today marks a milestone in my journey to create a typeface that I can share with the world and can be my rough around the edges legacy long after I am gone 😉 . Creating your own typeface can be a time consuming but very rewarding experience. I definitely enjoy the process and look forward to creating more custom Typefaces in the future. 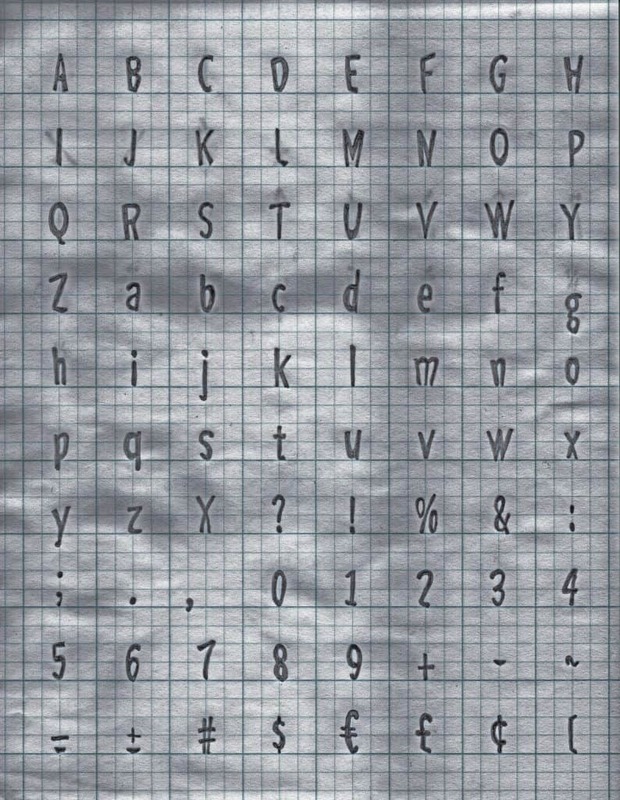 To create this particular, font I used software called Birdfont which is free and open source. If you like you can make a donation on the website as well if you are feeling generous : http://birdfont.org/. There are Mac, Windows, Linux and BSD versions of Birdfont. I wanted to do something that was hand drawn, but then cleaned up a little bit in Illustrator. So that the typeface would have a hand drawn feeling, but wouldn’t be too sloppy. I took a trip to the art supply store and I got myself some graph paper, a nice mechanical pencil, an eraser and some graphic pens. It’s not so often in my line of work that I get the opportunity to draw something out on paper, and translate that to a finished product. Usually I sketch things on paper and completely recreate them digitally, so my sketches are frequently sloppy and they are typically in the very early stages of a project, whether that is for a logo, a graphic element or a sketch / mock-up of a website. This typeface creation project ended up being a process that evolved as I went. It was something that I planned to do when I had a spare minute or two. In the end however, I started to look forward to working on it and I spent more of my spare time. I realize that it’s a pretty goofy looking font, closer in design to Comic Sans than it is to Helvetica or Trade Gothic. I see it being used for a chalkboard effect, or to perhaps to display a quote from a circus clown. We decided to name the typeface Paper, simply because that’s where it started. In the end this was mostly a learning process, a starting point for my passage into designing typography. If you have the time and the inclination you should try designing something yourself.